When thinking about our long haul flights from the UK to Orlando, Virgin and British Airways are two of the most popular aircraft carriers. We have flown long haul with both Virgin Atlantic and British Airways in the past. The thought of flying doesn’t fill me with dread, but the thought of spending hours on a plane isn’t very appealing. It’s definitely something I do because I have to. 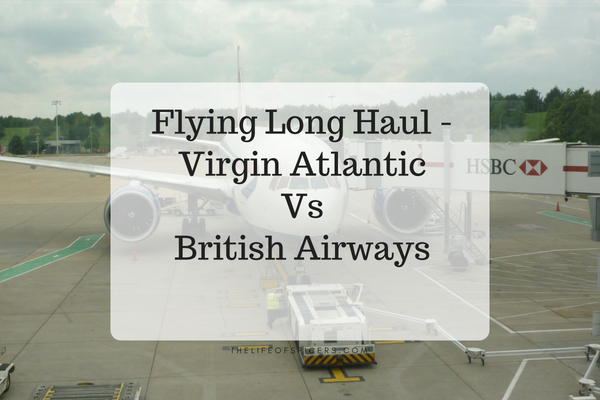 Which is best – Virgin Atlantic VS British Airways? We are at the stage now where I am thinking about booking our flights to Florida for next year. I know that some of the family would prefer to fly with Virgin Atlantic, whereas some of the family don’t mind either way. I will consider all options when looking at flights from prices, reviews, previous experience and recommendations. 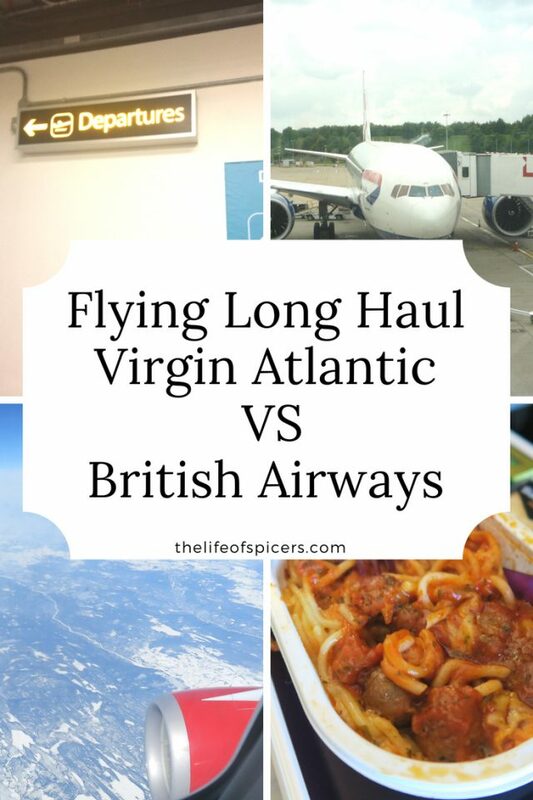 As I mentioned we have flown to Florida with both Virgin Atlantic and British Airways. Both flights were about the same length of time, and both flights got us there and back safely. We didn’t lose any luggage or suffer any damages with either airline, and from what I can recall the process was easy and without issue with both airlines. 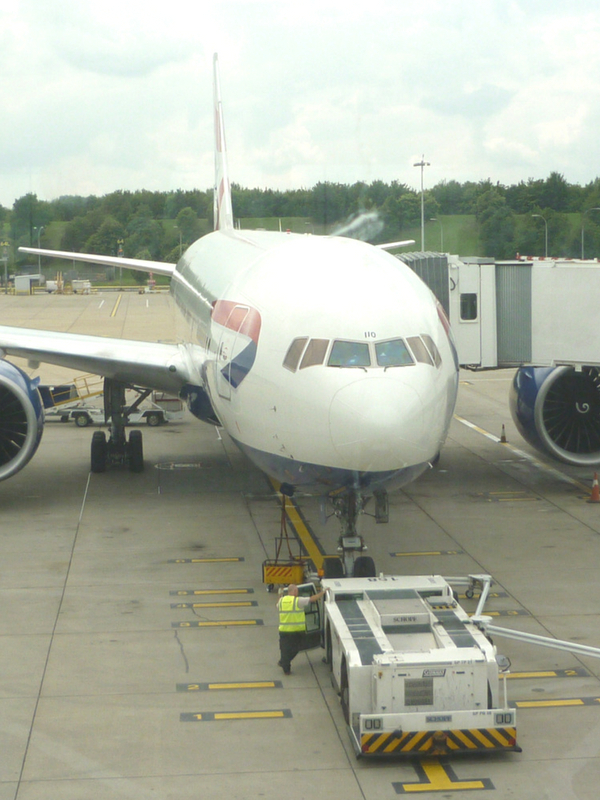 On our first British Airways long haul flight, we flew from Gatwick to Orlando on a British Airways 777. The plane has a 3,3,3 formation in Economy class. There were five in our party when we flew long haul with British Airways, and we had to decided which seating allocation would be right for our family. We decided that we would prefer to be seated along one row, so we ended up reserving seats as a cost across the left hand side three seats, a gap for the aisle and then we reserved two in the centre section. This meant that one of us would be sitting next to a stranger on both flights, but at least we would be able to talk to each other without turning around in our seats. This worked quite well for us as actually sitting next to a stranger on a flight was probably not at bad as I thought it would be. The only time I found it to be an issue was on our overnight flight home where I was in the middle next to my daughter and a stranger. I couldn’t get out for the loo as both sides of me were asleep. The food on a long haul British Airways flight was fine for aeroplane food. We had a decent choice, and it was edible so there were no complaints. We didn’t enjoy our meal on the way home, but I think part of that was down to slightly miserable cabin crew who were open that the food wasn’t great, and the fact that we were on our way home after an amazing holiday. The drinks service on a long haul British Airways flight is standard. We found that we could request additional drinks if we wanted them, however the drinks trolley didn’t do very many trips. Our economy class seats were standard, as comfortable as they could be, and no different in quality to the Virgin Atlantic planes. Our first experience of flying with Virgin Atlantic was the Virgin Atlantic Gatwick to Orlando flight taking just over nine hours. We managed to book seats in the economy class upper deck also known as the bubble. This provided us with a completely different experience of what economy class can offer, as the service is a lot more intimate, there are less people sharing a toilet and you have dedicated cabin crew. Our second long haul Virgin Atlantic flight we were seated in the standard economy cabin class downstairs in the plane. We found both experiences to her very different. Long haul Virgin Atlantic flights tend to be on a Boeing 747 with a 3,4,3 formation in the downstairs section of economy class. If you are travelling as a family of four, then the middle section downstairs is a great option for you all to be seated together. Are drinks free on Virgin Atlantic Economy? 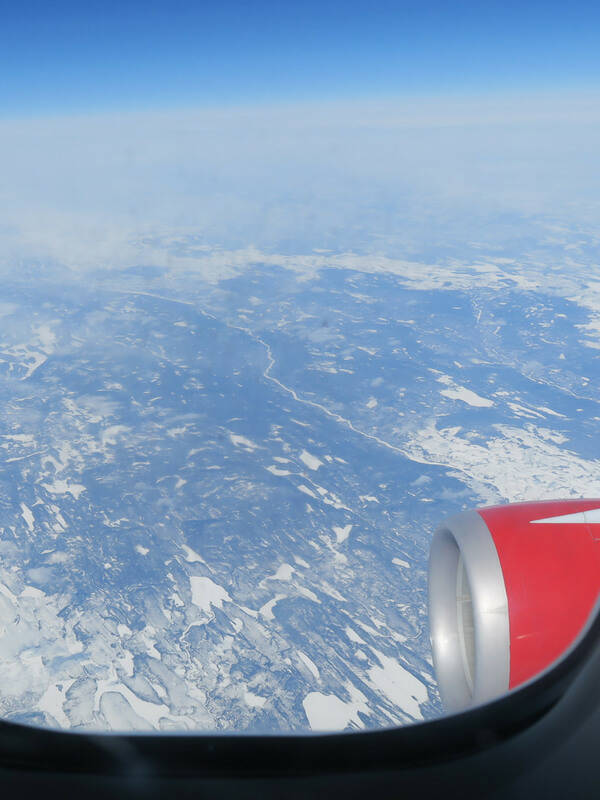 There is one thing that stood out for us flying long haul with Virgin Atlantic. The service appears to have that little extra touch. It feels as though we have no sooner taken off when the drinks trolley is round offering a dink and a bag of pretzels. What food do you get on Virgin Atlantic? By the time you have drunk this and the waste has been collected, the meal service is being handed out. 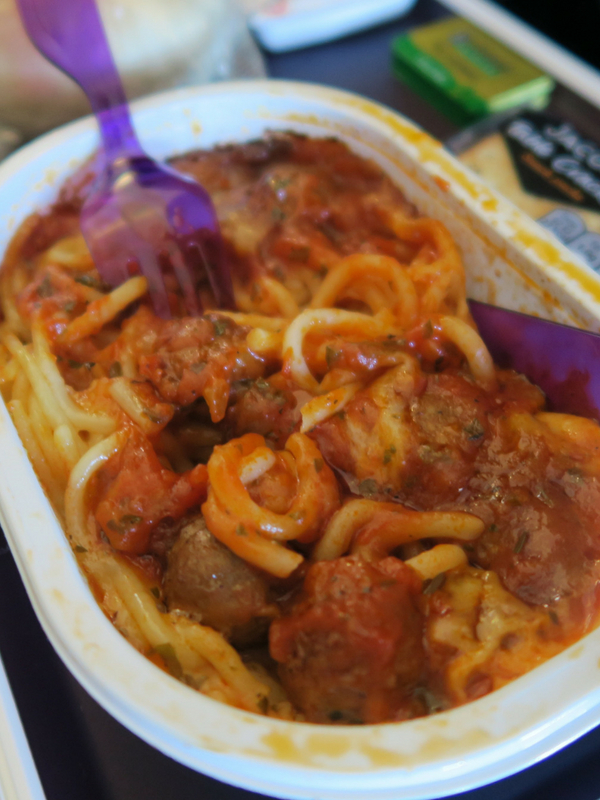 We have found the standard of food to be comparable between British Airways and Virgin Atlantic. Both meals are fine, they see us through the time, but we will never enjoy the breakfast from our return journey. After the meal service has been collected the drinks trolley is back round again. I don’t think anyone would need to request any additional drinks every if they wanted some as there always seems to be someone offering you something. There is always a lull before the afternoon tea is served / breakfast depending on your flight, and this is the only time in flying long haul with Virgin Atlantic that I get bored. I’m not a good sleeper on planes so I do like the distractions of food and drink to keep me occupied. When can you choose your seats on Virgin Atlantic? The seats on a Boeing 747 are a little tired now and we have found some issues with the trays being broken on occasion, or the seat won’t recline properly. The fleet is a little older now, so the wear and tear is to be expected, and we have never found anything so wrong that it couldn’t be rectified yet. If you have booked Economy Light seats, then you can either choose your seats for free 24 hours before your flight when you check in, or pay a fee to book them In advance. If you have booked seats in Economy Classic or Delight, you can choose your seats for free anytime after booking. Is there WIFI on Virgin Atlantic? There is WIFI available on Virgin flights since August 2017. We trialled the WIFI on our flight to Orlando from Gatwick. The speed was satisfactory for internet browsing, but not suitable for streaming. If you’re wondering whether to fly with Virgin or British Airways, I think I prefer flying long haul with Virgin Atlantic, however I am guided by price. We do definitely prefer the Virgin Atlantic drinks service though as they really did stand out against BA. As long as the price of long haul flights are comparable between the two companies, I will always go for the most convenient time and price for us as a family.